Whilst some businesses still rely upon outdated mechanical timeclock systems to monitor the working hours of their employees, the majority is now beginning to implement much more accurate and adaptable computer-based timeclock systems. Timeclock software development has given company managers the potential to widen the application of the concept of the timeclock to being much more than simply a measure of working hours. Timeclock software can now provide a fully integrated approach to managing a range of administrative tasks, which had previously proved time consuming and costly. 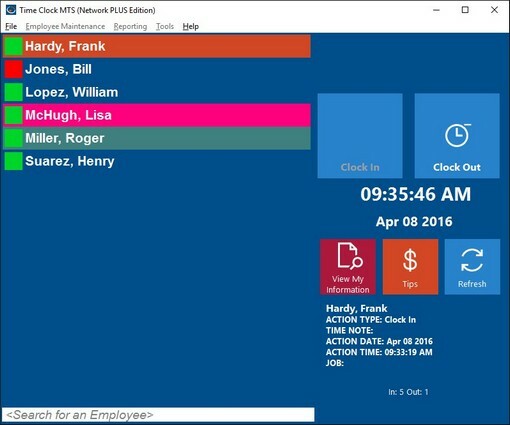 Employees clock into the timeclock software by manually selecting themselves from an on-screen list and entering their personal, private identification number, or a pin number to prohibit false clocking in by other employees. The format of information entry to the timeclock software is so adaptable that it is compatible with barcode readers and magnetic strip readers, so employers can, in fact, encode a barcode or magnetic strip with the timeclock badge numbers to allow for very quick clocking in and out. It is possible to require employees to enter a comment into the timeclock, when they clock in or out, providing useful records of activity. Timeclock software systems also provide a secure environment through which confidential data can be transferred. Password protected administrative areas prevent unauthorized access to administrative functions. Data records and files can be fully backed up and restored if necessary, and it is even possible to store all timeclock output on a networked drive. Business managers can define the rules of handling payroll data, so that the timeclock software is fully integrated to the procedures and protocols already in practice within the business. Timeclock data recording can be defined to start the working week on any day, calculating overtime limits and rates on a weekly or daily basis. The timeclock software can manage data relating specifically to salaried staff as well as those paid on an hourly basis. Shift and departmental areas can be defined to allow detailed management of a variety of aspects of the business. Holiday and break periods can be defined through the timeclock, to automatically adjust overtime calculations, or make adjustments or deductions for breaks from work, as appropriate to the specific procedures of the company. The concept of clocking in is also taken much further by the capacity of timeclock software to report its records in a variety of ways. Working hours, split by normal rate and overtime, on a weekly or hourly basis are reported in detail. Payroll reports showing a summary of all aspects of wage calculation can be produced very quickly, with the capacity to generate reports according to employee, shift or departmental groupings, and all reports and data records are fully compatible with a range of data management systems, such as Microsoft Excel. The development of timeclock software has fundamentally shifted the concept of clocking in. Such an integrated approach to timeclock management solves a host of administrative and clerical problems, with ease.